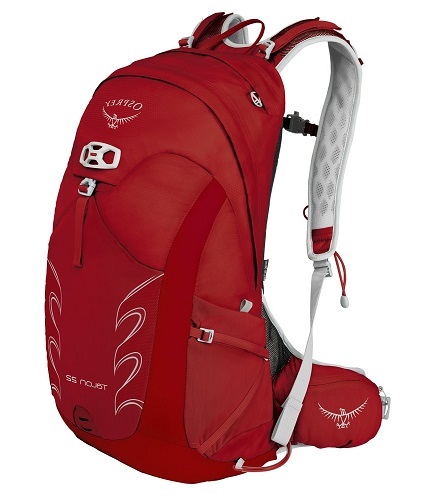 Osprey is one of the leading brands on the Camping/Hiking supplies market. Saying that they’re really good is an understatement, as they’re considered to be one of the best. This brand started out in California in 1974 with as much as a sewing machine, and now they’ve made it big, bringing only the best-quality hiking and camping supplies and gear. The Founder and Chief Designer of Osprey, Mike Pfotenhauer, built everything from scratch, and you can see his passion in every Osprey backpack. In our Osprey Talon 22 Review, we’re mainly interested in the Talon series, model 22 specifically. There are various reasons why this model is so important, but let’s just say that it features premium-quality materials, a great level of durability, excellent functionality, and a beautiful outward appearance. That’s, basically, everything we’re going to talk about. By covering the grounds of style, durability, functionality, and value for the cash, I’ve covered all the grounds of this magnificent backpack. All you need to do is simply kick back and decide whether or not it’s worth your money. Osprey is incredibly popular, and, in the case that you like the Osprey Talon 22 Review, you can get more detailed information about the entire Talon & Tempest series on their official website. One of the reasons why people like them is because they’re really connected with their customers. Their official site features various interviews with famous Athletes, such as Neil Gresham, Mike Horn, Xaver Mayr, Tracy Mosley, Lionel Daudet, and more. The Osprey Stories section is comprised of various short stories about travel, short guides, and Hiking Tips & Tricks. All in all, their site is full of valuable information that every traveler or hiker might need for a fruitful outdoor trip. Before we get to the Osprey Talon 22 Review, let’s talk about the series in general so that you can get a clearer picture. In the Talon series, Osprey offers us their renowned Talon 11, Talon 22, Talon 33, Talon 44, Talon 18, and Talon 6 Lumbar. Every model is quite distinctively different from the other, mainly in terms of design and functionality. While most hikers would agree that Talon 18 is best for them, bikers and casual travelers prefer Talon 11 (mainly because it’s more compact and lightweight). All in all, the entire series is filled with top-quality products, as they’re available in different colors and sizes. Basically, there’s something for everyone. The original Osprey’s Talon 22 is black, adorned with a beautiful Osprey™ logo on the top side, the Talon 22 mark on the bottom, and the Osprey’s signature bird-like emblem on the strips. Martian Red – The striking Martian Red color variant is something that is bound to turn the heads of bystanders. It’s beautiful, if not a bit on the aggressive side. Every model features the same design, style, and features, and each model is comprised of the same materials as the next. Again, it would be an understatement to say that Talon 22 is just beautiful. Every color variation provides a different set of advantages, and each model is exceptionally remarkable in its own right. Now, the story with sizes is very interesting. There are two standard sizes – small/medium, and medium/large, but Osprey also offers you the way to check your sizing info with their patented Sizing App. Osprey lets you find your perfect size with three easy steps by using their digital pack-fitting tool. Essentially, it’s more of a tour that will guide you through simple questions, and, ultimately, giving you the answer that you need. 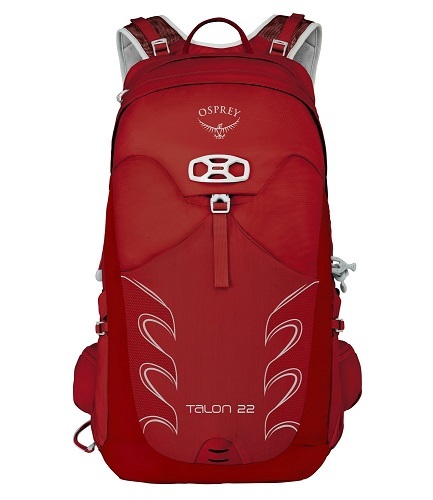 The Overall Rating of Osprey Talon 22 Style and Design gets 5 out of 5 stars. It’s simply superior to anything and everything you’ll come across in the price range – the dimensions are very cool, the brand offers a special app that will make sure you get a proper fit, the color variations are vivid, and the pack is extremely attractive. I simply must mention the comfort rating of this marvelous backpack. There’s a special feature that makes Osprey’s Talon 22 so comfortable to use, and that’s the AirScape™ accordion foam back panel. This outstanding feature is, basically, a type of foam-like panel that’s squishy and comfortable – back pain won’t be an issue, guaranteed. Comfort is what Osprey’s Talon 22 is all about. 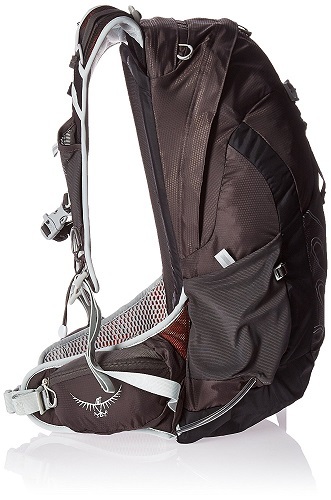 Even Osprey claims that this backpack is supposed to cling to the wearer’s back like a monkey. As I’ve already mentioned, the AirScape™ technology (the accordion foam back panel) is the key ingredient that makes the Talon 22 so comfortable to wear. This feature, when combined with the seamless body wrap, easily increases the air flow which provides additional comfort. 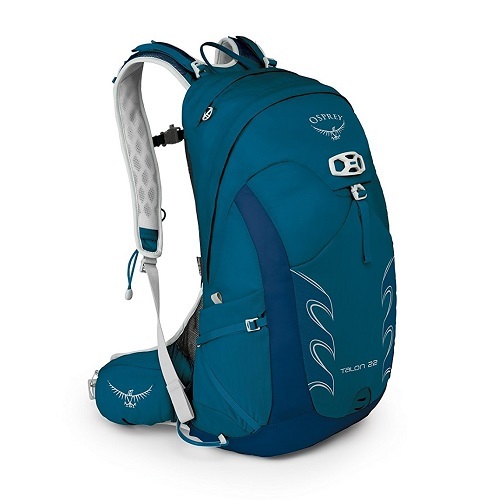 Osprey is the brand that looks out for hikers, travelers, bikers, and athletes, and they’re particularly interested in satisfying the needs of those who’re in need for a comfortable experience during their voyages. As for the material, Nylon is easily the most comfortable material that can be used for backpacks. When we compare it to polyester or fabric, it comes on top every time. Everything about Talon 22 serves for the single purpose – easiness of use and comfortability. A vast majority of reviewers worldwide have claimed that they just couldn’t find a backpack more comfortable, no matter how thorough their search was. I dare to agree. 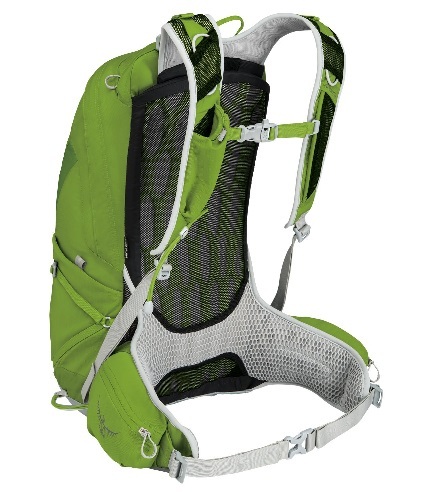 The Overall Comfort Rating of Osprey’s Talon 22 gets 5 out of 5 stars. It’s not just material, it’s the features. This backpack is designed with great care, and the brand went an extra mile to provide the hikers and athletes a product that they can use every day without having to worry about back sores or aches. One of the key features of this magnificent backpack is its durability – even though it was made to be very lightweight, it’s also built to last. With the 70D by 100D Nylon material construction, both qualities are provided. You practically won’t even feel it’s on your back, and you don’t have to worry about it ripping or tearing, ever. The “All Mighty Guarantee” is, perhaps, one of the key characteristics of Osprey’s Talon 22 durability. It’s, basically, a lifetime guarantee that you’ll get a premium-quality backpack for the price indicated, and that the brand offers free replacements and repairs in the case that any model is defect in terms of materials or craftsmanship. The Online Claim can be written on their official website, where you should provide all the info you can (with photographs, if you could), and the brand will resolve the issue as soon as possible. The Overall Durability Rating of Osprey’s Talon 22 gets 4 out of 5 stars. Basically, it features a durable construction, but it can’t be labeled as the sturdiest backpack of all time. Let’s put it this way – the main reason why this product got a four out of five is because the brand implemented the type of material that provides the lightweight quality. Essentially, functionality and versatility were attained at the cost of durability. We’ve come to the point where we will get to talk in a scientific manner – the features of Osprey’s Talon 22 are all but simple to explain. 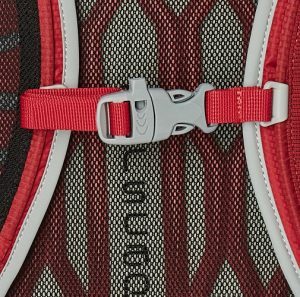 Essentially, there’s a manifold of features that come supplied to this backpack, but every single one has a clever purpose. For instance, we could just plainly say that there are a lot of pockets, that the straps are easily adjustable, and that there’s a whole bunch of additional unique features, but that just won’t cut it. As I’ve already mentioned, this may seem a little too scientific when compared to the casual explanation of the key features of this product, but it’s quite handy to have a list of features. 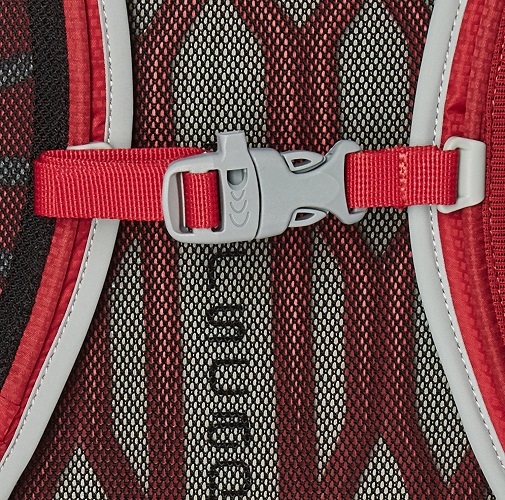 All in all, the uniqueness of Talon 22 is best seen in the manifold of features, as most hiking backpacks can’t even come close. You’ll come to realize that these many features aren’t an overkill. Hikers, bikers, and adventurers need most of these things on their trips. The Overall Features Rating of Osprey’s Talon 22 gets 5 out of 5 stars. With this many features, it’s easy to deduce why the rating is so high. Even though it may take a while before you can utilize every feature at your whim, but you’ll come around eventually. It’s safe to say that Osprey’s Talon 22 is incredibly versatile, which further improves the rating, but there’s no need to go beyond the 5. 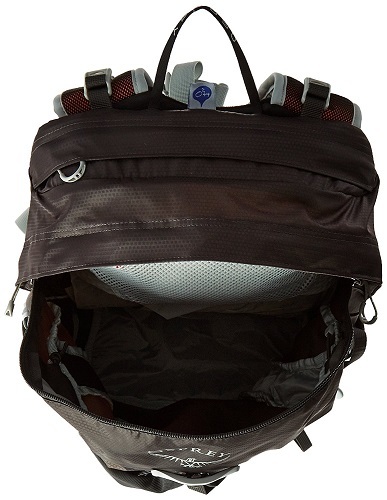 This backpack is capable of fulfilling the needs of every athlete, hiker, biker, adventurer, and explorer with ease. If there were a test that would measure Osprey’s Talon functionality, it would pass with flying colors. We’ve covered pretty much everything that can be said about this marvelous hiking backpack, and, by now, you could have pictured all things good and bad about it. 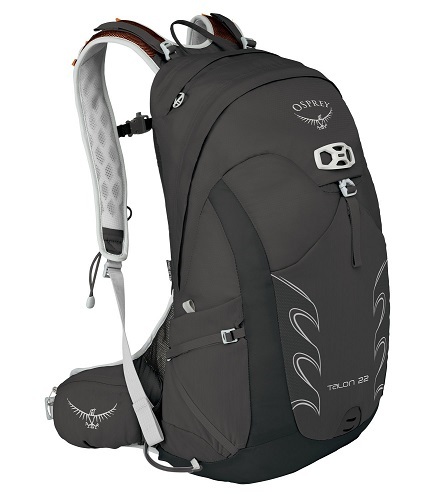 Osprey’s Talon 22 is one of the best backpacks that money can afford. Sure, it’s very expensive, but it’s a keeper. It features premium-quality materials, superior functionality, a satisfactory durability, and a majestic set of features. If you’re into hiking or camping, this might be the perfect backpack for you. 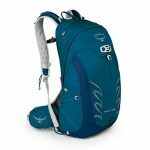 The Overall Rating of Osprey’s Talon 22 gets 4 out of 5 star!